The integration of the spin degree of freedom in charge-based electronic devices has already revolutionized both sensing and memory capability in microelectronics. A second generation of devices is now envisioned in which pure spin currents (a diffusive flow of spins with no net charge flow) could be used instead, with several proposals that advance towards the integration of spin logics and memory and could represent a post-CMOS paradigm. 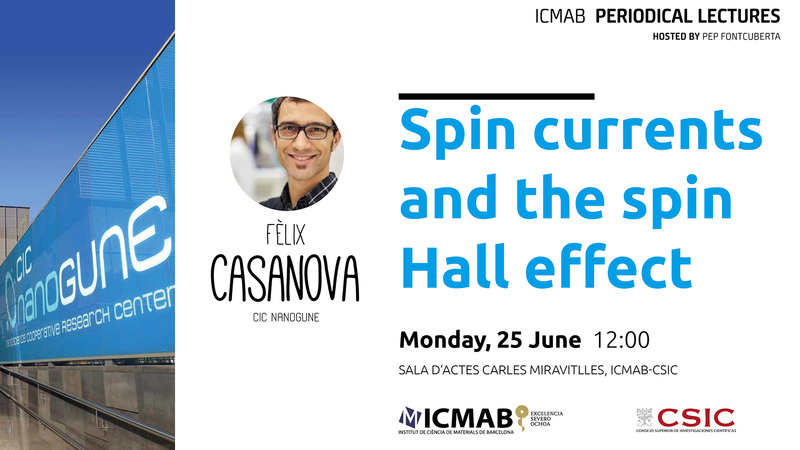 A key player in this quest is the spin Hall effect (SHE), a phenomenon that occurs in non-magnetic materials with strong spin-orbit coupling and allows to electrically create or detect pure spin currents without using ferromagnets. The SHE has a common origin with the anomalous Hall effect, a classical phenomenon in ferromagnetic materials. Understanding the different mechanisms giving rise to the SHE allows to find and optimize promising materials for an efficient spin-to-charge current conversion. The SHE has been essential to discover novel spin-dependent phenomena, and some of them are being explored for potential applications. Fèlix Casanova is an Ikerbasque Research Professor at CIC nanoGUNE (Basque Country). He obtained his Ph.D. in Physics from Universitat de Barcelona in 2004 with a study of the magnetocaloric effect. He was a postdoctoral researcher at the University of California, San Diego from 2005 to 2009, where he worked in a variety of projects in nanoscience, including nanoporous materials and spintronics in metals, and he acquired extensive experience in nanofabrication techniques. Since 2009, he is the coleader of the Nanodevices Group at CIC nanoGUNE, devoted to the electronic properties of systems in reduced dimensions. His current research interests are focused on spin-dependent phenomena (including spin transport and spin-orbit effects) in metals, insulators and novel two-dimensional materials. His pioneering studies on spin-charge interconversion in metals have led to an R+D contract with Intel Corp., the world-leading microelectronics company. He is Editorial Board member of Physical Review Applied, published by the APS.